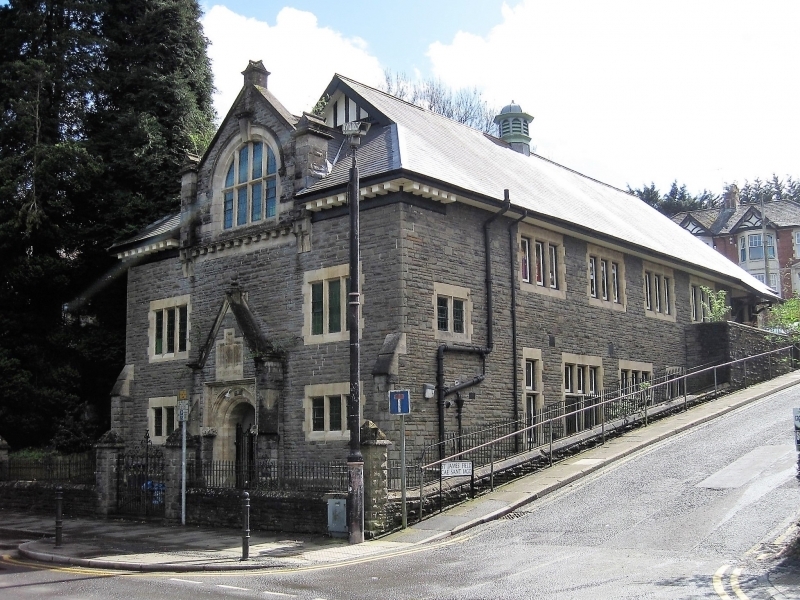 Location: In Pontypool town centre next to St. James's Church. An Edwardian church hall dating from about 1910. Squared rock faced limestone rubble with freestone, probably Bath stone dressings, and a Welsh slate roof. Single cell hall on the upper floor with offices below, with the gable end to Hanbury Road and the long side fronting St James's Field. In an Edwardian style with some Art-nouveau influences. The main elevation has a central entrance with windows on either side, windows lighting the staircase on the first floor and a large attic window in the gable above. Gabled porch with recessed double doors and iron gates. Coping and kneelers to the gable which contains a stepped tripartite feature. The windows are rectangular 3-light with chamfered stone mullions in plain frames. A heavy modillion cornice flanks the central gable which is supported by two small buttresses and has a coped pinnacle. The buttresses are supported on double brackets and a modillion cornice runs between them. The gable contains a 4-light window with mullions and transom in an ashlar frame with semi-circular head with large keystone. Small gablet at the end of the main roof ridge with vertical timbering and plain bargeboards. Side elevation is two storeys with two 3-light mullion and transom windows on the ground floor with additional smaller windows. Above are four 3-light windows as on the front. On the left hand end is a small 2-light window between the floors for the staircase. At the right hand end is a doorway with tented hood with direct access to the hall on the upper floor. Plain roof with central octagonal ventilator. End gable elevation is partly hidden by a red brick single storey extension. Above the ridge of this is a 4-light window in the gable end of the main hall with vertical timbering above. Bargeboard to the main gable. The upper floor has an open hall with plain boarded roof on principal rafters, lower floor offices not seen at resurvey (April 1997). Included as part of an especially good group of C19 and early C20 urban buildings on this side of Hanbury Road. At the south-east end of Pontypool town centre.